Browsing articles tagged with " build steel pole barn"
You can rest assured knowing that every steel pole barn from Coast to Coast is constructed using high quality materials. In addition, we strive to deliver such excellent products at reduced rates so that they accessible to everyone. We have multiple building styles to choose from, as well as customizable buildings. Our solid construction efforts ensure that each of our buildings will stand the test of time. They are strong, durable, and very adaptable. 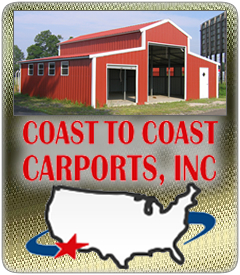 Coast to Coast’s wholesale prices make getting the perfect steel pole barn easy. It is important to have an unobstructed space and our metal structures do not disappoint. Whether it is for working, storing livestock, or equipment; having a beam free area is an invaluable asset. Daily operations run much smoother and efficient when unnecessary maneuvering is taken out of the equation. Free space makes moving around livestock, tractors, forklifts, and other farming equipment hassle-free. Coast to Coast recognizes the importance of keeping your livestock and farming equipment safe and secure. We offer steel barns that ensure optimal safeguarding of such valuable possessions. In addition, insulation can be added to any steel pole barn to help keep animals and working conditions warm during the long, cold, and brutal winters. Moreover, a metal building takes the snow, sleet, and chilly winds out of the equation as well. Our mission is to keep things as simple and straightforward as possible. We provide excellent customer service, timely delivery, and easy to follow erecting instructions in order to ensure a satisfactory buying experience. We even have delivery and construction crews that can arrive on site and have your metal building erected in no time at all. We are here to help and serve you from beginning to end. Our customer service agents are committed to finding the perfect building for your individual situation. We cover all aspects including discussing possible building locations, ground leveling, size needs, and the appearance of your steel structure. We want to make certain that you are happy with your building and that you remain a Coast to Coast customer for life!